Great Falls is a peaceful and naturally beautiful area which is home to the Great Falls of the Potomac River, for which the community and the park are named. A small suburb with major appeal. Residents enjoy wide-open spaces indoors and out. $1 million-plus homes set on two- to five-acre lots ensure plenty of privacy. There are no condos, apartments or town-homes in this D.C. suburb, but the distance between neighbors is less vast than you might think. An active newcomers group welcomes recent arrivals, and good old-fashioned socials in the Village Centre bring everyone together for community events. Great Falls Village Centre is in the heart of Great Falls and offers a wonderful mix of retail shops, professional businesses, restaurants and catering, art and dance studios, and health and educational services. The Great Falls Village Centre is also a place where families and friends can join together to celebrate and share traditions. Many annual events include, The Children’s Spring Festival and Egg Hunt, The Summer Concert Series, The Fourth of July Hometown Celebration & Parade, Halloween Spooktacular with Haunted House, and The Celebration of Lights featuring the Annual Tree Lighting. Each of these events is family oriented, free and open to the entire community. For a peaceful hike, a family outing, an exploration of the area’s rich history, or all of the above, the 800-acre Great Falls Park is a can’t miss. The Great Falls National Park features extraordinary views of the Potomac and Great Falls, along with 15 miles of hiking trails, and five miles of horseback riding and biking trails. Great Falls National Park has gorgeous scenery, rolling rapids, and miles of nature to explore. Great Falls Park is popular for outdoor activities such as kayaking, whitewater rafting, rock climbing, and hiking. The park has several viewing platforms that provide visitors with vantage points overlooking the falls. 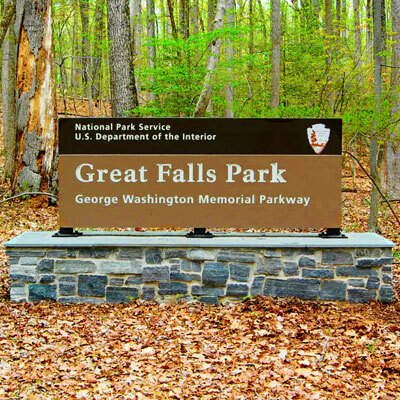 The NPS operates a visitor center near the falls.Fifteen miles (24 km) of hiking trails encompass the park and follow a small stream known as Difficult Run. A scenic trail near the river travels upstream from a landing at the mouth of Difficult Run, climbs to the top of Mather Gorge and passes the falls, a dam, and a reservoir before ending in Fairfax County’s Riverbend Park. Tucked away in a remote river setting, Riverbend Park has over 400 acres of trails, forest, meadows, and ponds. Colvin Run Mill, Fairfax County’s award-winning operational 19th century water powered gristmill, offers recreational and educational activities for all ages through daily tours, school programs and special events. Economy: CNN Money ranked Great Falls first in the nation on its list of "top earning towns" in 2011. Great Falls is home to many notable residents including celebrities, professional athletes and team owners as well as numerous government officials and CEOs. Educationn: Great Falls students attend Great Falls Elementary School, Forest-ville Elementary School or Colvin Run Elementary School. These schools feed into James Fenimore Cooper Middle School, the feeder for Langley High School. All Great Falls schools are part of the Fairfax County Public School System. Getting Around: The main roads serving Great Falls are Virginia State Route 7 (Leesburg Pike) and Virginia State Route 193 (Georgetown Pike). Route 193 provides access to the Capital Beltway, McLean, VA, and points West into Loudoun County. History: Early on, the village was known as Forest-ville, but was named Great Falls in 1955. George Washington was involved with building a canal around Great Falls on the southwest, or Virginia, side, called the Patowmack Canal, which did not become commercially viable. Remnants of the canal and of a village around the canal named Matildaville are still visible in the park. The Great Falls and Old Dominion Railroad extended along Old Dominion Drive to Great Falls Park in 1906.